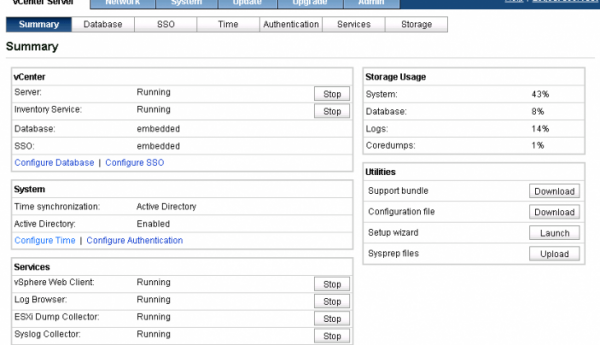 In version 6.0, the configuration interface that you used to access to do all this stuff (the Virtual Appliance Management Interface, or VAMI) is no longer available for the vCSA. VMware published a technical note which provides a configuration comparison that will help you transition from the vCenter Server Appliance 5.5 to the vCenter Server Appliance 6.0. In version 5.5, most of vCenter Server Appliance configuration tasks can be done using the VAMI: configure database settings, network settings, change the SSO mode, start and stop services, configure auto-deploy or dump collector, upload sysprep files, and so so. Source : Comparing the Configuration of vCenter Server Appliance 5.5 and 6.0.